Tom Hardy isn’t the main character of Peaky Blinders, a BBC show about an upwardly mobile 1920s Romani crime family by the same name. He doesn’t show up until season two as Alfie Solomons, the leader of a Jewish gang in London who becomes one of many adversaries faced by Tommy Shelby (played by Cillian Murphy), the leader of the Blinders. Hardy’s character disappears for much of the third season, but resurfaces for a few scenes in the last two episodes. All told, Hardy’s scenes could have been shot in a day or two, and yet his portrayal of Solomons the highlight of the show. Peaky Blinders is essentially a show about the lengths people will go to lie to themselves—okay, it’s also a show about good haircuts and people looking really stylish and cool while walking in slow motion, but mostly that other thing—and by season three Tommy Shelby is neck-deep in self-delusion. He’s reached the apex of the classic gangster come-up story, evolving from a street thug to a member of the landed gentry, all while thinking he can enjoy the protections of the straight world and simultaneously maintain his ruthlessness in the criminal world. So when the shadowy agents of the British government (SPOILER) kidnap his son, he’s shocked and appalled at their willingness to act like criminals. Even if you have no intention of ever caring about or watching Peaky Blinders, I still recommend you watch that scene. (It really gets going around 2:40 in.) Watch Hardy’s face after Murphy reveals that his son has been taken—Solomons slips into a state of shock before becoming defiant, and we find out a minute later that he had no idea about the kidnapping. When Shelby tells Solomons that he knew he was unaware of the kidnapping because he saw the truth his face, we as viewers can feel the weight of the dialogue. We saw the truth on Solomons’s face, too, because Hardy showed his work. The lines Hardy is given to work with in the scene above aren’t any less clunky than “I got the shotgun, you got the briefcase,” but he still manages to make them crackle. 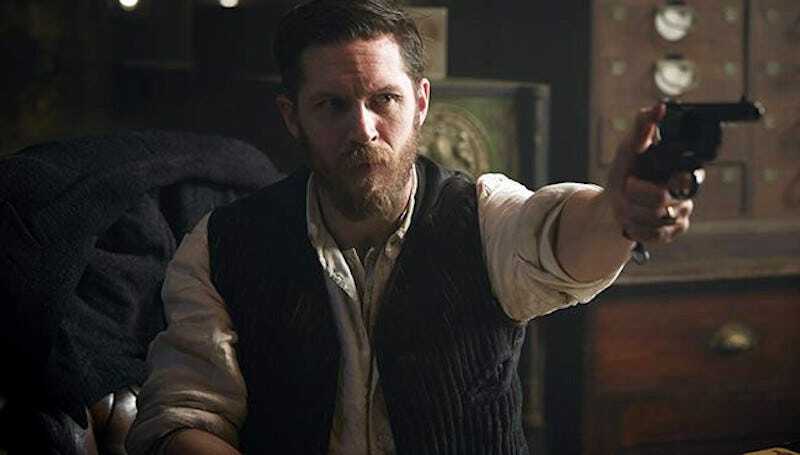 The power of the scene is derived entirely from Hardy’s ability to seesaw between rage, incredulity, and righteous indignation. He’s tasked not only with detonating the life that Tommy Shelby has built for himself, but with providing a turning point in the story. This is where Shelby’s journey into legitimacy is revealed to be built on a lie, and that’s not the kind of revelation that is easy to deliver in an artful and compelling way. The task is Hardy’s, and he pulls it off flawlessly. By my lights, there is no better scene-stealer currently working than Tom Hardy. He turned in the best performance in The Dark Knight Rises despite being burdened with a dumbass mask and a weird vocalizer; he went into the woods with Leonardo DiCaprio in The Revenant and not-so-quietly put the Oscar winner’s performance in the trash can; and now here he is guest starring on a BBC show that nobody expects an actor of his stature to appear on, and he’s he stealing the whole shebang in one scene. It’s hard to imagine an actor being better at what he does.